Sanizorb 400 is used to instantly absorb and deodorise spillages on all surfaces. The fine crystals imbibe and expand taking in up to 400 times their own volume in liquid. The resultant gel that forms encapsulates the spillage which is then removed by scoop and spatula into an appropriate waste bag. Sanizorb 400 is ideal for removal of vomit, blood, urine, food and drink spillages and has undergone stringent testing at the land & Marine laboratory to confirm its properties. Sanizorb lends itself to carpeted as well as hard floor areas due to its rapid absorbent qualities. 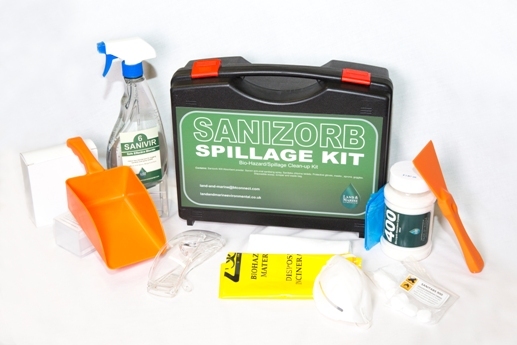 The Sanizorb kit has been designed for ease of use and storage for any emergency spillage . Perfect for onboard any public transport and ready to use, this kit is ideal for Norovirus and gastro intestinal illnesses outbreaks or accidents, clearing , absorbing and sanitizing the area(s). Extremely useful and powerful tool to have at your fingertips. The kits contains over 10 applications, and is one of the most cost effective and largest kits on the market.